Throughout my cancer journey, I’ve made mental and physical notes to myself about cancer, about people with cancer, about my cancer. They’re random, casual and brief — almost all would fit on a sticky note. This is my first sticky note. Early on after my cancer diagnosis, Kristina, a friend then in a courageous contest with breast cancer, advised, “Don’t get caught in the Calendar Game” — that bell curve of statistics that seeks to bracket the X and Y of years of probable longevity. “Those numbers include all kinds of people,” Kristina said. “Focus on your disease, your treatment and your health.” I’ve always thought that was sound advice: There are people in those numbers with multiple health problems, people who never took care of themselves, people who don’t follow their doc’s advice, and on and on. They become part of the odds, and probabilities, and chances. It’s about all, not about you. Or me. 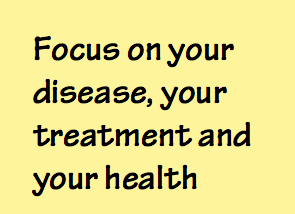 Focus on your disease, your treatment and your health. Bill I couldn’t agree more. Despite having a medical background, the thought of asking about statistics regarding prognosis, complications, and likelihood of future disease has never occurred to me. As Kristina points out, the spectrum of patients, their many and varied co-morbid conditions, attitudes, diet, exercise, motivation, etc.etc. is virtually infinite, and trying to draw conclusions from the ‘Bell Curve’ that includes them is completely meaningless. I am starting to realize the axiom ‘attitude is everything’ really is true. Much as there are diseases to which patients with the best attitude will succumb, a positive personal mindset and all of the benefits that accrue from that may be the most important therapy available.